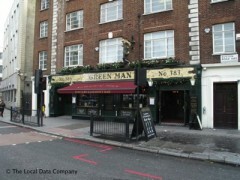 About: The Green Man serve traditional pub food as well as vegetarian dishes. They also serve fish and chips to take away. They have fruit and quiz machines. They can cater for private parties of up to 100 people in their function room and provide outside seating on the pavement. They also accept Luncheon vouchers as a method of payment.